I often hear people complaining that they go to the gym but never see any results. The gym isn't a magical place where you can go and achieve results by osmosis -- trust me, I've tried -- but some people seem to treat it this way. Although everyone is different, here are some key factors explaining why you aren't seeing the results you want. Isolation exercises, or exercises working one specific muscle group, should really be saved for accessory work at the end of workouts. Whether you are looking to get stronger or burn more fat, your first exercise(s) should be multi-articulated, or exercises that work multiple large muscle groups. For lower body, think about squat and deadlift variations. For upper body, think about bench press, overhead press and pull-up variations. You aren't doing yourself any favours by going to the gym and immediately hopping on the leg extension machine. Not comfortable with these more challenging compound exercises? Ask one of the personal trainers for assistance -- this is what they are there for! I constantly see the same people doing the same exercises at the gym. 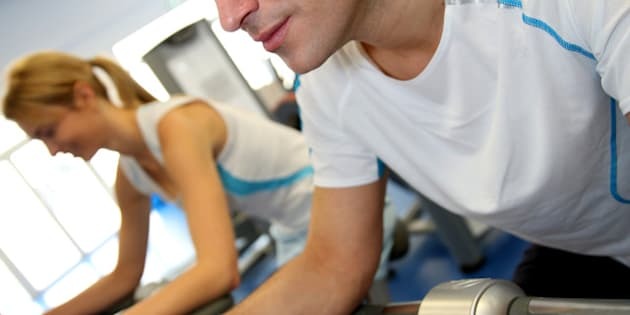 It's OK to have your favourite exercises (it's a GREAT thing to enjoy any kind of exercise, and you should use this as motivation to get to the gym! ), but if you do the same thing every time at the gym, your body will never adapt. Make an effort to try new exercises, or at the very least, switch up your set and repetition scheme -- if you typically do 3 sets of 12 repetitions, the next time at the gym do 4 sets of 8, and the next time do 5 sets of 6 (with the corresponding increase in weight of course, but I'll get to that in a bit). If you see someone at the gym doing an exercise you don't know, don't hesitate to stop and ask them about it. Or again, ask personal trainers for some suggestions, and ask them how to show you proper form -- it's their job! Regardless of your reason, you should have weights in your workout regime as well. Steady-state cardio will burn calories, but if you add weight training into the mix, you'll see big results. Weight training builds muscle. Muscle burns fat. Therefore, more weight training can lead increased fat loss. This goes hand-in-hand with the comment about a lack of variety. I find that women have the hardest time with this concept, as they are afraid that lifting heavy weights will give them chest hair and make them look like a wrestler from the WWE. Ladies, if you stay away from steroids, weights will be the best thing that ever happened to you. Lifting heavy doesn't have to be done with every exercise, but again, you need to introduce your body to a new stimulus if you want it to adapt (and in turn, see results). As a rule of thumb, and especially for your first, multi-articulated exercise(s), you should use a weight that is close to what you can maximally lift. If your goal is to do 4 sets of 6 repetitions, use a weight that you can lift no more than 8 times before failure, while maintaining proper form. This may take some trial and error to figure out, but you'll definitely be introducing a new stimulus as you do this as well, so don't be shy! If your heart rate isn't elevated and your muscles aren't getting tired, you likely aren't lifting heavy enough. I was guilty of this for years. I would go to the gym and push myself, but I never thought about the importance of refuelling my body. Without the proper macronutrients and vitamins and minerals, your muscles cannot recover properly, and the work you did at the gym will go to waste. Lifting weight tears your muscles apart, and it's your nutrition that rebuilds them bigger and stronger. Make sure to consume carbs and protein immediately following your workout and make an effort to eat high-quality food on a regular basis. If you're finding it hard to eat right because of a hectic schedule, supplementation should not be overlooked. I understand that the gym can be a social place for many people, but if your primary objective is to change your body, your workout program should come first and your social life should come second. Taking too much time between sets can be extremely counter-productive and limit the efficiency of your workout. Strength training (lifting near-maximal weight for low reps) requires more recovery time between sets, but most workouts require less than 2 minutes of rest between sets. If you're going to chat, try to do it between exercises, not sets, but always keep your priorities in mind. As I mentioned above, eating low-quality foods or not eating enough will be extremely detrimental to the recovery process post-workout. Aside from diet, excessive stress, poor sleeping patterns, and other lifestyle factors such as alcohol abuse are equally (if not more) problematic. Exercising can help mask the negative effects of these aspects of life (which is sometimes the goal for people at the gym), but if you intend to see your body adapt and progress, a healthy diet, sleeping pattern and lifestyle are paramount. We aren't all experts, but exercising isn't brain surgery. Using common sense and listening to your body can go a long way. Asking an expert is also a simple thing to do. If you're not seeing the results you expect, ask yourself the following questions: How is my diet? Am I really pushing myself at the gym or am I just going through the motions? Do I have enough variety in my program? Don't be afraid to make a change and try something new, your body will thank you! There are countless explanations for why people fail to see results at the gym, but if you tackle the issues above, I'm sure you'll see a huge difference. For more information on increasing the quality of your time at the gym, don't hesitate to send me an email: fitinafatworld@gmail.com.